EARA recently attended the Grand Opening of the Hall of Aviation “A Century of Flight: The Story of Aviation in Miami,” that was held March 23, 2017 at the History Miami Museum and Miami International Airport at as shown on the front page of “KIT”. 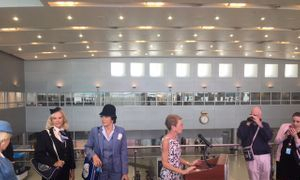 They contributed many artifacts of Eastern Airlines, that will be shown at this museum now and in the future. Plan to stop by and take a look! "A Century of Flight: The Story of Aviation in Miami"
MIAMI – On March 23, 2017, History Miami Museum and Miami International Airport hosted the grand opening of the Hall of Aviation, “A Century of Flight: The Story of Aviation in Miami,” a permanent living history gallery which features various exhibitions showcasing Miami’s long and illustrious history with flight. The first exhibition, A Century of Flight: The Story of Aviation in Miami, features images, airplane models, and uniforms that illustrate Miami Airport’s rise as a commercial aviation hub and as the aviation gateway to the Americas. Miami’s history as an aviation mecca began over 100 years ago in July of 1911, when Howard Gill flew his biplane over the Miami Golf Link, celebrating the fifteenth anniversary of the city. At the end of his flight demonstration, local Miami businessman Ernest Sewell flew aboard Gill’s airplane over Miami for the first time. In 1912, the Curtiss Aviation School opened in Miami, paving the way for Miami to become the flight and maintenance training capital of the world, something that it is still known for worldwide today in training present airmen. With generally good weather year round, Miami was an ideal location for training. The U.S. Marines and U.S. Army Air Corps would train pilots here in Miami at local air bases, such as Opa-Locka. Famed civilian airlines, such as Pan American World Airways and Eastern Air Lines, who both called Miami, FL their home, would be invaluable resources to the war effort during World War II. the forerunners of Eastern Air Lines. They pioneered airmail and passenger service throughout the Caribbean and South America from Miami International Airport, FL. At the exhibit, one can view a cutaway Pan Am 747-100. 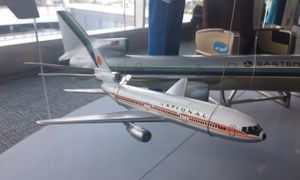 National Air Lines DC-10, can also be seen at the exhibit at Miami, as well as an Eastern Air Lines L1011 (below) at the History Miami Museum and Miami International Airport. These planes were all once daily sights at the airport. 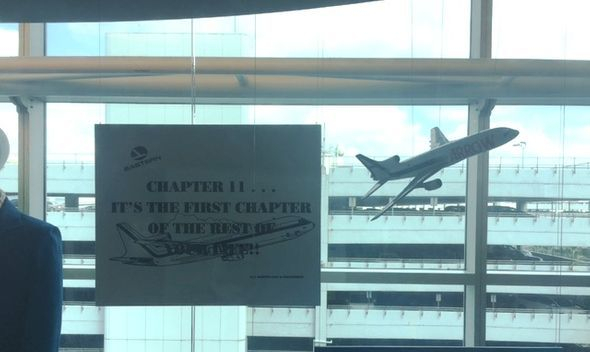 Above photo with the EAL logo, Reads: Chapter 11…“It’s The First Chapter Of The Rest Of Your Life” and pictured is the L-1011 in the background as well as the model on the right. 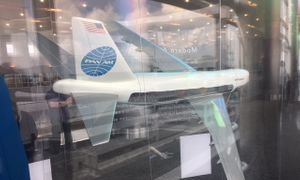 Present at the event was Marcie Rickenbacker, granddaughter of the late Captain Eddie Rickenbacker, former Chief Executive Officer of Eastern Air Lines. She spoke of her times in Miami as she watched it blossom into the International hub that it is now. 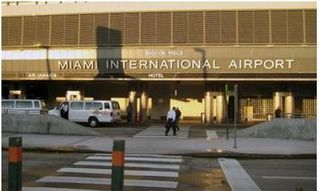 Miami International Airport has the most air carriers serving it of any U.S. airport today and is also a hub for several cargo carriers. Miami has grown so much over the last century, as has Miami Airport. Carriers such as Eastern, Pan Am, National, and Braniff have long since flown their last flights, but their influence and history remain. EARA recently attended the Grand Opening of the Hall of Aviation “A Century of Flight: The Story of Aviation in Miami,” that was held March 23, 2017 at the History Miami Museum and Miami International Airport at as shown on the front page of “KIT”. They contributed many artifacts of Eastern Airlines, that will be shown at this museum. Be sure to stop there and take a look! MIA has blossomed as an international travel hub, serving four continents on a daily basis. Miami continues to add several carriers yearly, the next being WOW Air, which will inaugurate Miami’s first ever service to Reykjavik, Iceland on April 5. Aer Lingus will also connect Miami to Dublin, Ireland starting on September 1, 2017. 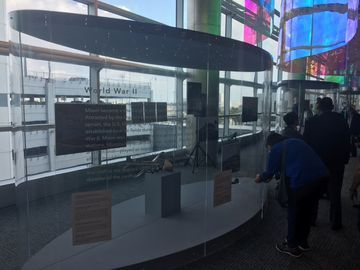 The Hall of Aviation at Miami Airport, located in Terminal J on the 4th floor just outside the international arrival’s greeting area will evolve over years to come, with new exhibits coming soon. It is intended to grow with the airport as a living history tribute to Miami’s past, present, and future. Roland Moore, a former contracts lawyer who worked at Eastern from the 1960s until 1991 remembers walking down a Southwest Airlines Jetway two years ago when he saw an Eastern lapel pin on the Captain flying the plane he was about to embark on. Moore asked the pilot if he flew for Eastern, who said the pin originally belonged to his father. A young Flight Attendant nearby then said she never heard of Eastern. “We both looked at her and asked how old are you?” Moore said. After replying she was 21, they both laughed and exclaimed, well Eastern did end 25 years ago. Now, the physical history of one of Miami’s greatest airlines is coming home. Eastern Airlines Retiree Association has donated a large historical archive to the University of Miami. The donated materials include flight crew uniforms and pins, timetables, instruction manuals, publicity materials, maps, photos and passenger menus. The university plans to eventually put the archive on public display. Photo provided to the Miami Herald: Eastern Airlines Retiree Association has donated a large . The donated materials include flight crew uniforms and pins, timetables, instruction manuals, publicity materials, maps, photos and passenger menus. Female flight attendants (then referred to as stewardesses) were even required to retain certain measurements on Eastern. For example, flight attendants who were five-feet four-inches tall were required to have a maximum weight of 123 pounds. “In the early days to be a flight attendant or stewardess it was a very prestigious job,” Moore said. “It was probably harder to be a flight attendant than get into Harvard Law School. They selected one out of 10 applicants who had to be stunning and wear a size four dress. They took great pride in their work.” Eastern flight attendants called themselves the Silverliners, a group that in its heyday had about 4,000 members. Many are still active today. Moore says it was also a very different customer base back in the day. Male passengers weren’t allowed to fly unless they had on coats and ties. Also, the cost for flying was much higher. “Today you can fly from New York to Miami for around $100,” Moore says. “Back then, the airfare was $150 and those were in 1960s’ dollars.” Eastern’s glory days eventually faded. On Dec. 29, 1972, the airline’s Flight 401 from New York’s JFK Airport to Miami crashed in the Everglades, killing 101 passengers and crew. There were 75 survivors. 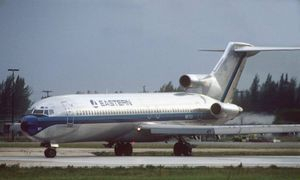 In the 1980s, Eastern buckled in large part to airline deregulation and labor disputes under then-company President Frank Borman, the former astronaut. The photos here and above were provided to the Miami Herald.